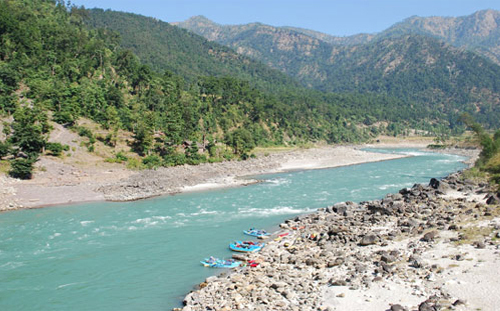 The Karnali River is Nepal’s mightiest river. The Karnali river rafting is arguably the finest multi day river trip in Nepal for those wanting a more unique experience of Nepal, stunning scenery, great river action and all the benefits of a long river trip in Nepal. Lowland trek that combined with most beautiful canyons found in Nepal makes Karnali rafting/kayaking one of the most memorable river trips available in this country. After monsoon the rapids of Karnali River are demanding a huge, though relatively straightforward. In low water the demands on the rafter are more technical, though equally exciting. The Karnali’s headwaters come off of Mount Kailas in Tibet, the center of the universe for both Buddhist and Hindu religions, and then slice through the Himalayas in a series of magnificent isolated gorges and forest. This is Nepal‘s largest and longest river, flowing uninhibited through the least populated region of the country. Rafting in Karnali river is not an easy thing with lots of rapids. Average fitness is required not to be in the pain make sure you have enough experience to enjoy the rafting. Your safety is one of our major concern. Your guide has the authority to amend or cancel any part of the itinerary if it is deemed necessary due to safety concerns. 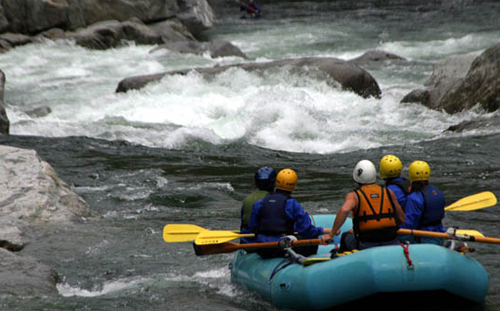 Since this adventure entails Rafting in the river, we will have safty kayakers as well. The Guide will try to ensure that the trip runs according to plan, but please be prepared to be flexible if required. After breakfast in Kathmandu, we start long bus drive upto Surkhet today. Arriving Surkhet in late night. Overnight stay at hotel in Surkhet. Day-2: Drive to Dungeshwar, rafting start. After breakfast we continue our unspoiled scenery drive to Dungeshwar (5 hrs), the rafting starting point. 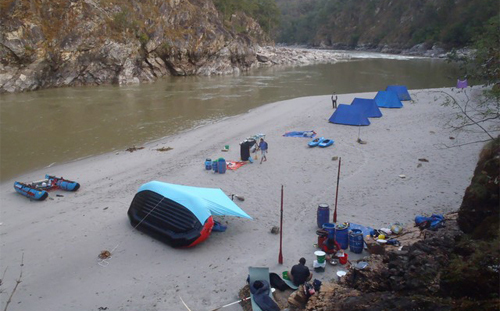 After short rafting we set up the camp by the river bank. There are good rapids and water flow those allow learning errors. We face great class IV rapid today. Camp in the beach. This is also another adventurous day with some narrowing jungle clad gorge. We all keep paddling hard. Overnight in the camp. The day goes in the same way. We keep enjoying the some high and low rapids. Camping at the river bank. It isn’t over yet! Keep paddling hard! You are experiencing another day of great action and breathe taking scenery. Today we come out of the gorge and confluence with the Seti River. There is a chance to enjoy the view. Enjoying the white water rafting with some of safety kayakers. You getting chance to learn about the real rafting. Today is the last day in river. We stop our raft in the river bank. Pack up the gears and come to have lunch in the highway hotel. Our vehicle will be waiting us to take our next destination. We will reach Kathmandu/Pokhara by the next morning. Those who have booked to go to Bardia National Park (highly recommended! ), will be collected from here as well. Any services not mentioned in the itineraries. Start your adventure with us ! This trip can be possible to customize as you want and you may extension your Nepal trip as well. Here are the few options what you may do. We will provide tourist standard accommodations in Kathmandu and this is possible to upgrade in your choice. All the accommodation in the cities and trekking will provided on twin sharing basis. Single supplement will be served on request and will cost extra. During Karnali River Rafting, we will provide tents accomodation and authentic Nepalese food (Dal Bhat) as well the more common international cuisine (Tibetan, Continental, Italian, Indian, etc.). 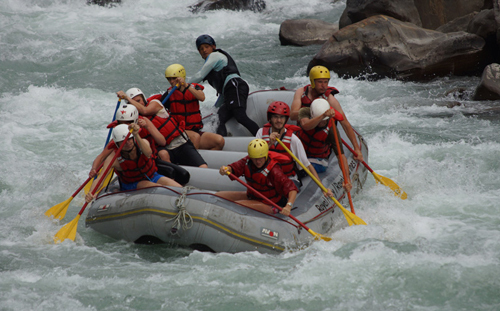 3 main course meals will be provided during rafting and only breakfast is included while you are in Kathmandu and. 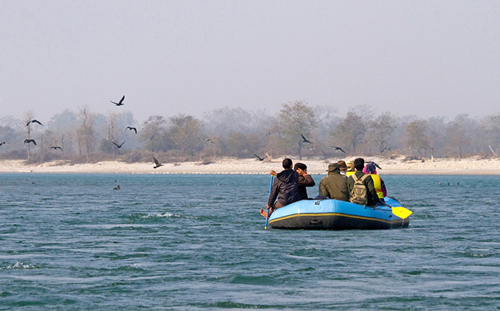 Autumn (Sept to Nov) and Spring (March to May) are the best seasons to do Karnali River Rafting. The weather is sunny and warm with outstanding views. However, the temperature during winter could be harsh for most guests and there chance to get wet with cold water. Rafting in the Summer or Monsoon seasons (June to Aug) will be affected by rain but the Summer rafting could be a boon for a keen botanist. You are advised to consider the following equipment as essentials while packing. Please use this link as a guideline. 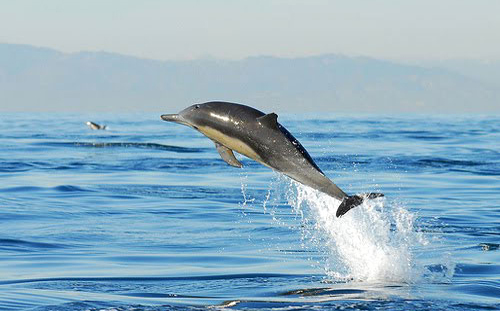 Adjustments to the list can be managed according to our requirements, interests, duration of trip, and season of trip. We can find variety of these gears to hire or buy in Kathmandu. Majority of the gears which are in sale in Kathmandu are locally manufactured (hence a lot cheaper) and can find very high quality branded gears too in some famous stores in Kathmandu. Please make a selection How difficult is the Karnali River Rafting? How fit do I need to go Karnali River Rafing? What if I am a solo? Is there a supplemental for singles? When should I go for Karnali River Rafting? What equipment do I need to go Karnali River Rafting? Are there any ATM's on the way? Do I need to purchase my own travel insurance for Karnali River Rafting? Will I have access to the Internet? Can I charge my camera batteries on the trip? Will my mobile phone work on the Rafting? What is the accommodation like? What happens if I get sick or get hurt while Rafting? Who are the guides? Will I have to carry all of my own stuff on the Rafting trip? Is the water and food safe on the Trip? More questions? Rafting in the Karnali river is quite hard, as a Rafter some essential item for rafting are mostly needed. There are some of rapids involved. People with weak health condition should take caution. Use caution or seek the expertise of a guide. Person must be in excellent physical condition for Karnali River Rafting. It is joint programe. There must be a minimum group of people for Karnali rafting. It may also be an option to join a group, please contact us to find out more. The best time to go Karnali River Rafting is in March-April and September-October. Except the personal usable gears like goggles, sun creams, hat, light cloths and shoes/flip flop , we provide all essential items whatever is needed for rafting. Yes most of the cities has ATM. Yes. Most trips run smoothly, but once in awhile something unexpected can happen, that’s why we highly recommend that before coming to Nepal you purchase travel insurance. We take all the necessary precautions to make sure your safety is at first-hand, but it is always best to have it. Please see our travel insurance section for more information. It is possible from the mobile data. Most of places we have good networks. No, you better to carry some extra batteries. Cell phones work at most of the places, sometime depending on your mobile provider. There are also phone services nearby almost everywhere we go. While in Kathmandu we generally stay in very nice 3-4 star hotels, when we are in rafting we will provide tents accommodation. There are basic pharmacies in larger villages along the rafting. This is another reason to be sure you are covered with adequate travel insurance! Mountain World Treks hires guiding professionals with a love and passion for outdoor travel and adventure. Our Sherpa guides have been with us for many years and know the trails well. They all speak English very well and know how to take good care of the clients. Please see our About Us page for more information on our guides. No, unless you request to. The tap and mountain water in Nepal are generally not safe to drink for tourists. Bottled water, boiling water or using water purification tablets are your best options. Tea and coffee are okay to drink. Yes, the food is safe in Nepal. And delicious! For more information Please Contact us. © 2016, Mountain World Treks & Expedition Pvt. Ltd., All right reserved.